The Guitar Column: Steve Vai Owned Ibanez RG550 on eBay | JEM Prototype? Steve Vai Owned Ibanez RG550 on eBay | JEM Prototype? 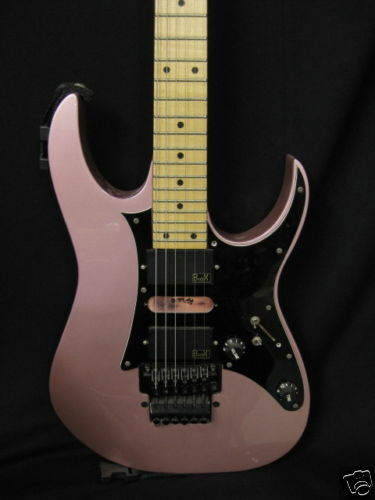 This eBay seller lists this Steve Vai owned Ibanez RG550 as a JEM prototype. While we can't be absolutely certain about the prototypical history of this instrument without dropping an email to Mr Vai's camp and hoping for a response, Steve Vai memorabilia collectors will probably get a kick out of the owned-by-Steve factor alone. 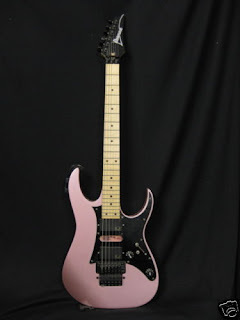 Vai's site states that this Ibanez RG550 does not have a serial number, was used as a tester guitar for trying out different pickups (this axe currently sports BiaX pickups) and was eventually auctioned for a charity. Notice that this guitar was once retrofitted with a tremelo guard, a simple metal frame attached over the Edge tremelo by two screws on each side of the trem. A feature on the original Loch Ness green JEMs -- Vai wanted to be able to rest his hand on the bridge without making it go sharp -- the tremelo guard was phased out on subsequent models. A JEM prototype? I suggest getting verification directly from the Bad Horsie's mouth. Sorry Steve, couldn't resist that last one.